The architecture of Yugoslavia was characterized by emerging, unique, and often differing national and regional narratives. As a socialist state remaining free from the Iron Curtain, Yugoslavia adopted a hybrid identity that combined the architectural, cultural, and political leanings of both Western liberal democracy and Soviet communism. 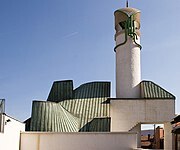 Yugoslav architecture emerged in the first decades of the 20th century before the establishment of the state; during this period a number of South Slavic creatives, enthused by the possibility of statehood, organized a series of art exhibitions in Serbia in the name of a shared Slavic identity. Following governmental centralization after the 1918 creation of the Kingdom of Yugoslavia, this initial bottom-up enthusiasm began to fade. Yugoslav architecture became more and more dictated by an increasingly concentrated national authority which sought to establish a unified state identity. Beginning the 1920s, Yugoslav architects began to advocate for architectural modernism, viewing the style as the logical extension of progressive national narratives. 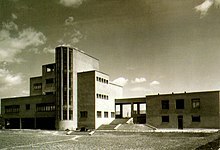 The Group of Architects of the Modern Movement, an organization founded in 1928 by architects Branislav Đ Kojić, Milan Zloković, Jan Dubovy, and Dusan Babic pushed for the widespread adoption of modern architecture as the "national" style of Yugoslavia to transcended regional differences. Despite these shifts, differing relationships to the west made the adoption of modernism inconsistent in Yugoslavia WWII; while the westernmost republics of Croatia and Slovenia were familiar with Western influence and eager to adopt modernism, long-Ottoman Bosnia remained more resistant to do so. Immediately following WWII, Yugoslavia's brief association with the Eastern Bloc ushered in a short period of socialist realism. Centralization within the communist model led to the abolishment of private architectural practices and the state control of the profession. During this period, the governing Communist Party condemned modernism as "bourgeois formalism," a move that caused friction among the nation's pre-war modernist architectural elite. Socialist realist architecture in Yugoslavia came to an abrupt end with Josip Broz Tito's 1948 split with Stalin. In the following years the nation turned increasingly to the West, returning to the modernism that had characterized pre-war Yugoslav architecture. During this era, modernist architecture came to symbolize the nation's break from the USSR (a notion that later diminished with growing acceptability of modernism in the Eastern Bloc). The nation's postwar return to modernism is perhaps best exemplified in Vjenceslav Richter's widely acclaimed 1958 Yugoslavia Pavilion at Expo 58, the open and light nature of which contrasted the much heavier architecture of the Soviet Union. 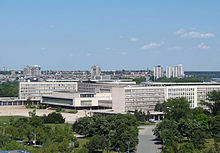 In the late 1950s and early 1960s Brutalism began to garner a following within Yugoslavia, particularly among younger architects, a trend possibly influenced by the 1959 disbandment of the Congrès Internationaux d'Architecture Moderne. Brutalism's growing influence in the nation was most prominently exemplified in reconstruction efforts of Skopje following a destructive 1963 earthquake. Japanese architect Kenzo Tange played a key role in pushing for Brutalism in the city, going so far as to propose a full redesign of the Skopje in the style. With 1950s decentralization and liberalization policies in SFR Yugoslavia, architecture became increasingly fractured along ethnic lines. Architects increasingly focused on building with reference to the architectural heritage of their individual socialist republics. Growing distinction of individual ethnic architectural identities within Yugoslavia was exacerbated with the 1972 decentralization of the formerly centralized historical preservation authority, providing individual regions a new opportunity critically analyze their own cultural narratives. Yugoslavian architecture, particularly that of monuments, has attracted increased public attention in recent years. In the late 1990s and early 2000s, Belgian photographer Jan Kempenaers released a series of photographs documenting dilapidated World War II monuments and memorials in Yugoslavia. In July 2018 MoMA opened a 6 month exhibition entitled "Toward a Concrete Utopia" that provided visitors with a large collection of images, architectural models, and drawings from Yugoslav architecture from 1948 to 1980. ^ "Toward a Concrete Utopia: Architecture in Yugoslavia, 1948–1980". The Museum of Modern Art. Retrieved 2019-01-31. ^ a b Farago, Jason (2018-07-19). "The Cement Mixer as Muse". The New York Times. ISSN 0362-4331. Retrieved 2019-01-31. ^ CNN, Jonathan Glancey (2018-07-17). "Yugoslavia's forgotten brutalist architecture". CNN Style. Retrieved 2019-02-01. ^ a b McGuirk, Justin (2018-08-07). "The Unrepeatable Architectural Moment of Yugoslavia's "Concrete Utopia"". ISSN 0028-792X. Retrieved 2019-01-31. ^ a b Deane, Darren (2016). Nationalism and Architecture. Taylor & Francis. ISBN 9781351915793. ^ Milosevic, Suncica (2013). Seeking identity in former Yugoslavia's socialist architecture. University of Cincinnati. OCLC 865511042. ^ Bičík, A. (2008). "Modern Architecture in Croatia 1930's". Acta Polytechnica. 48. ^ Đorđević, Zorana (2016). "Identity of 20th Century Architecture in Yugoslavia: The Contribution of Milan Zloković". Култура/culture. 6. ^ a b Babic, Maja (2013). "Modernism and Politics in the Architecture of Socialist Yugoslavia, 1945-1965" (PDF). University of Washington. ^ a b Vladimir., Kulić (2012). Modernism in-between : the mediatory architectures of socialist Yugoslavia. Jovis Verlag. ISBN 9783868591477. OCLC 814446048. ^ Alfirević, Đorđe; Simonović Alfirević,, Sanja (2015). "Urban housing experiments in Yugoslavia 1948-1970" (PDF). Spatium (34): 1–9. ^ Kulić, Vladimir (2012). "An Avant-Garde Architecture for an Avant-Garde Socialism: Yugoslavia at EXPO '58". Journal of Contemporary History. 47 (1): 161–184. doi:10.1177/0022009411422367. ISSN 0022-0094. JSTOR 23248986. ^ Kulić, Vladmir. "Edvard Ravnikar's Liquid Modernism: Architectural Identity in a Network of Shifting References" (PDF). New Constellations New Ecologies. ^ di Radmila Simonovic, Ricerca (2014). "New Belgrade, Between Utopia and Pragmatism" (PDF). Sapienza Università di Roma. ^ Lozanovska, Mirjana (2015). "Brutalism, Metabolism and its American Parallel". Fabrications. 25 (2): 152–175. doi:10.1080/10331867.2015.1032482. ^ "Curating the Yugoslav Identity: The Reconstruction of Skopje | post". post.at.moma.org. Retrieved 2019-02-01. ^ "Reconstruction Plan for Skopje". architectuul.com. Retrieved 2019-02-01. ^ Entertainment, The only biannual Magazine for Architectural. "YUGOTOPIA: The Glory Days of Yugoslav Architecture On Display". pinupmagazine.org. Retrieved 2019-02-05. ^ Herold, Stephanie (2010). Reading the City: Urban Space and Memory in Skopje. Univerlagtuberlin. ISBN 9783798321298.